Today is the final day of Endometriosis Awareness Week. I’m curious about how well awareness of this condition is fairing. Endometriosis is a condition that affects 1 in 15 women of reproductive age worldwide, and is influenced by the hormonal changes that occur during the monthly menstrual cycle. During a normal cycle, the lining of the uterus becomes thicker – a sort of fluffing-up-of-the-pillows type preparation to welcome the arrival of the fertilised egg. In the absence of a fertilised egg, the brand new lining is pretty much redundant and so, without further ado, is shed from the uterus – an event marked by the start of a period. Over approximately 4-7 days, this act of shedding slowly thins out the uterus lining and the whole cycle starts all over again, month after month (see below). Changes in thickness of the uterus wall lining during a menstrual cycle. With endometriosis, the tissue (called endometrium) that makes up the uterus lining has actually found its way outside of the uterine cavity. What this means is that each time hormonal changes occur during the menstrual cycle, not only do these hormones trigger the uterine lining to become thicker and then shed, they also influence the stray (ectopic) endometrial fragments that have become attached to other areas of the body. The most common sites for these ectopic endometrial growths are the fallopian tubes and ovaries but they can also be found in various other areas of the pelvic and even abdominal cavity (see opposite). 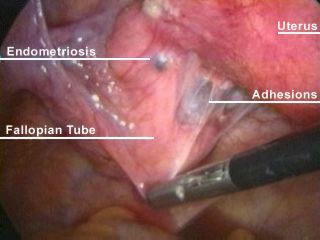 I won’t post the image here, but if you are interested in seeing what ectopic endometrial adhesion looks like, click here to find out. Endometriosis is a really important condition for not just women to be aware of, but men also because spotting the symptoms early on can lead to quick diagnosis and prevention of progression to something more sinister like infertility or even cancer. Until we know the definitive cause of this condition (there are about three theories), spotting and acting on the symptoms are all we have. The charity Endometriosis UK have just recently launched a blog, designed to help anyone concerned about their own or someone else’s period and to discuss what’s “normal”. They can also be contacted through facebook and twitter. So please, if you have any worries or questions or just want to check out what’s being talked about, do get in touch with them through these various channels online or, if you prefer, call their helpline on 0808 808 2227. For a true insight into how severe this condition can be, read Lucy’s incredible story (here) of her life with endometriosis. « How do histologists diagnose tuberculosis?